Download "Next Generation. Surveillance Solutions. Cware. 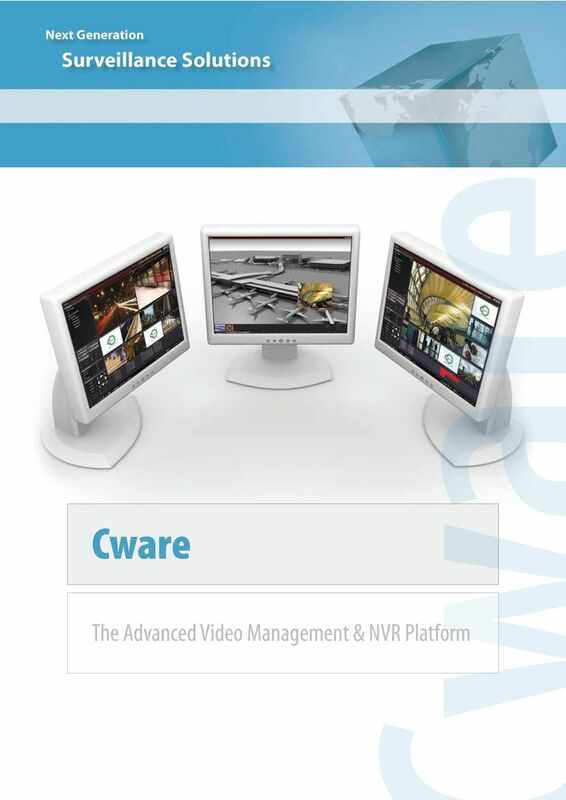 The Advanced Video Management & NVR Platform"
2 Advanced Open Management Benefit from the most effective CCTV management platform Cware is an advanced video management and Networked Video Recording (NVR) platform that makes control of surveillance networks simpler and more effective than ever before. Based on open standards architecture Cware provides the freedom to create integrated surveillance networks. Support of multiple IP cameras and encoders from a range of manufacturers ensures investment protection for existing network equipment and integration with new products and technologies in the future. An advanced user-friendly interface that can be customized to meet individual requirements enables simultaneous access to live and recorded video making it easy for all levels of security personnel to operate and control the system. 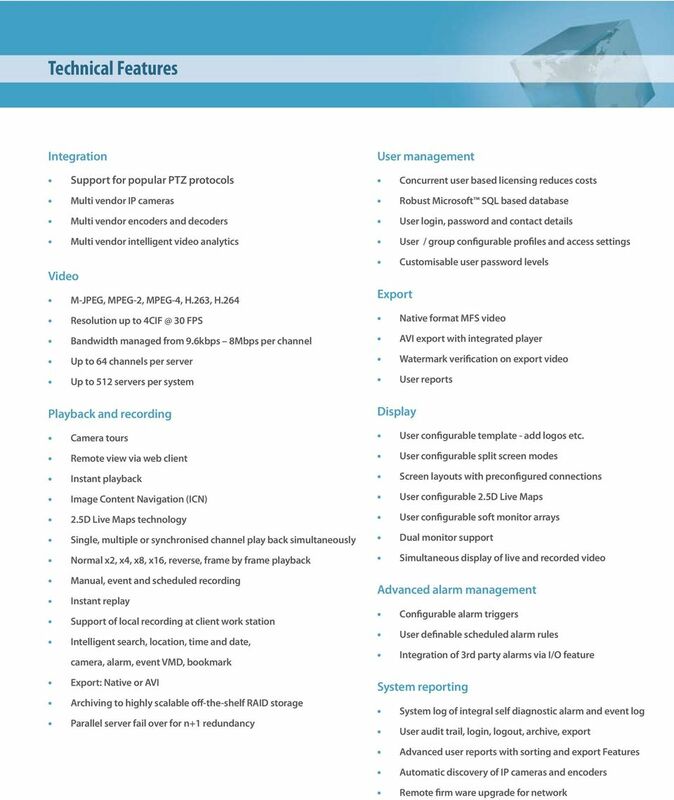 Comprehensive vid-eo management, on screen display, alarm, recording and playback features deliver support for limitless cameras, recording servers and operator workstations. Ad-vanced features such as Image Content Navigation (ICN) and 2.5D Live Maps provide unrivalled video interaction, innovating the way locations are monitored. 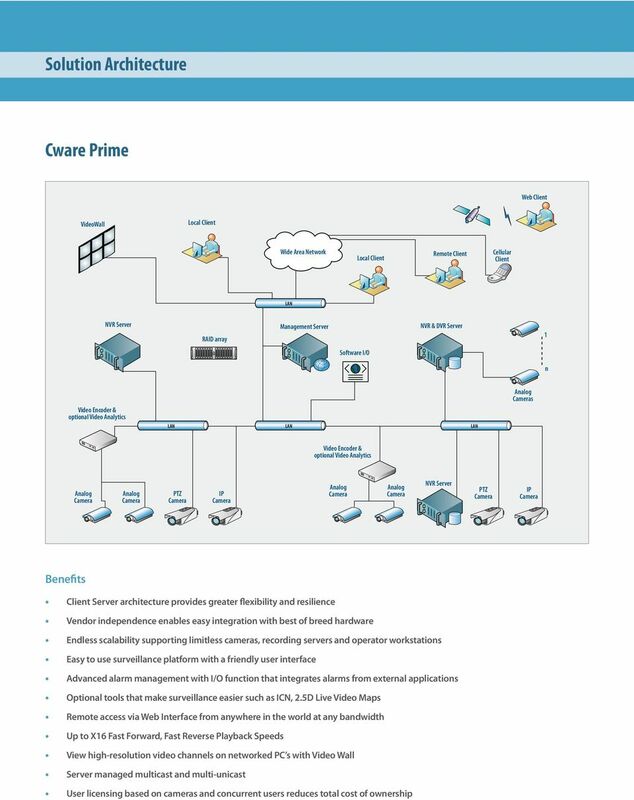 Highly flexibly and cost-effective architecture enables Cware to easily manage single or multiple locations and all sizes of installation, supporting thousands of cameras. A modular approach utilising common PC, networking and storage hardware, provides a platform for endless scalability, without requiring full and costly system upgrades. The number of cameras, clients and storage capacity can be increased with ease and by supporting a high level of system redundancy disruption to security operations is minimized. Having supplied thousands of solutions through a worldwide network of channel partner s, real world experience is at the heart of Cware development. Based on flexible architecture, boasting advanced features and designed specifically for the user Cware delivers all the advantages of a next generation management platform today. 4 Features Cware System Open Standards Multi-vendor support allows users to select the equipment they want to use from the manufacturers of their choice. 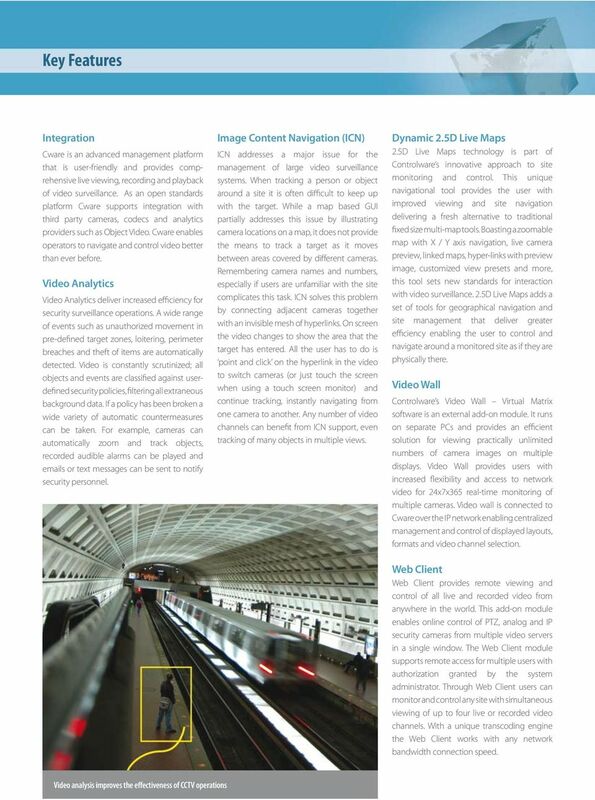 Video Content Analysis Integration with content analysis found in cameras encoders and external servers can be associated with triggers to activate video channels, drive video wall displays, drive external devices and send s. Flexible Client Server Architecture Network expansion is cost-effective with support of limitless cameras, recording servers and operator workstations. Viewing, Recording and Video Export User Customization Layouts including text, images and maps can be customized for specific users or groups, allowing quick familiarisation with the system reducing training requirements. User friendly control is also possible through a range of options that include joystick, keyboard or PC mouse. 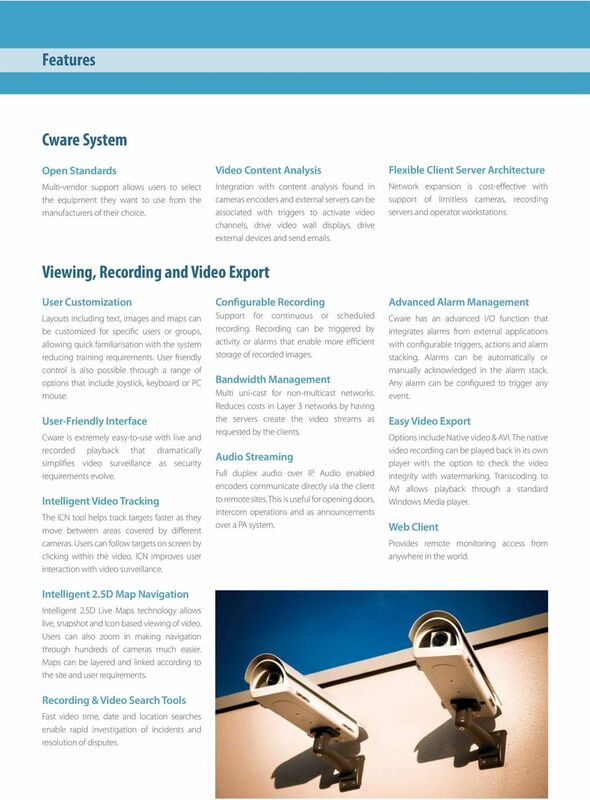 User-Friendly Interface Cware is extremely easy-to-use with live and recorded playback that dramatically simplifies video surveillance as security requirements evolve. Intelligent Video Tracking The ICN tool helps track targets faster as they move between areas covered by different cameras. Users can follow targets on screen by clicking within the video. 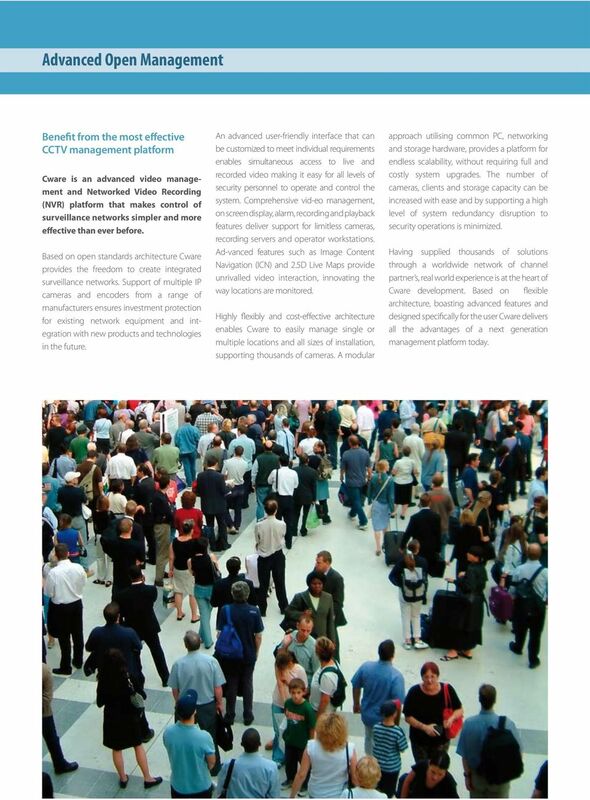 ICN improves user interaction with video surveillance. Intelligent 2.5D Map Navigation Intelligent 2.5D Live Maps technology allows live, snapshot and Icon based viewing of video. Users can also zoom in making navigation through hundreds of cameras much easier. Maps can be layered and linked according to the site and user requirements. Recording & Video Search Tools Fast video time, date and location searches enable rapid investigation of incidents and resolution of disputes. Configurable Recording Support for continuous or scheduled recording. Recording can be triggered by activity or alarms that enable more efficient storage of recorded images. Bandwidth Management Multi uni-cast for non-multicast networks. Reduces costs in Layer 3 networks by having the servers create the video streams as requested by the clients. Audio Streaming Full duplex audio over IP. Audio enabled encoders communicate directly via the client to remote sites. This is useful for opening doors, intercom operations and as announcements over a PA system. 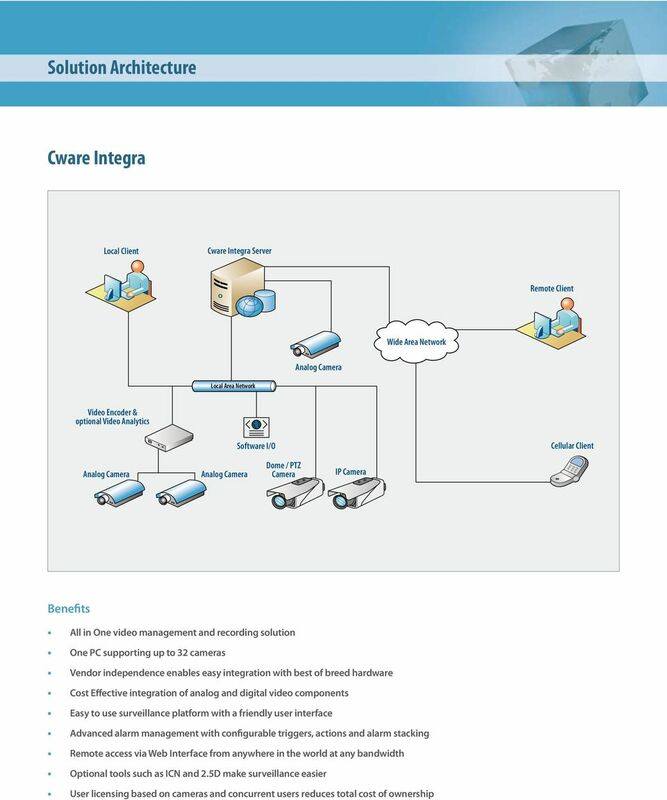 Advanced Alarm Management Cware has an advanced I/O function that integrates alarms from external applications with configurable triggers, actions and alarm stacking. Alarms can be automatically or manually acknowledged in the alarm stack. Any alarm can be configured to trigger any event. Easy Video Export Options include Native video & AVI. The native video recording can be played back in its own player with the option to check the video integrity with watermarking. Transcoding to AVI allows playback through a standard Windows Media player. Web Client Provides remote monitoring access from anywhere in the world. This document provides software feature comparisons to help make the best decision. Digifort Enterprise The most complete Digifort solution for camera and alarm monitoring. The National Policing Improvement Agency (NPIA) chose a VideoEdge Network Video Management System as the backbone of the security system, as well as the integral part of their Practical Training Block.